Carefully open the lid of your MacBook. Start the notebook. Now, survey its contents and tell me whether it’s a vibrant and powerful machine or an eleven-by-eight inches tomb for duplicate and useless files. If you’ve taken a pause before answering the question, the chances are that your MacBook can benefit from some cleaning. There’s no need to frantically launch the Finder to track down folders containing duplicates: you already know where those reside. Apple Apperture is a photo management app that can harbor thousands upon thousands of identical images. Even if you are not a professional photographer who stores heaps of snapshots on their Mac, it is more likely than not that your photo library is brimming with duplicates. Those who use the Burst Mode on their iPhone know that after pressing the shutter button, the device gets filled up with practically indistinguishable images. After those photos are transferred to a Mac, they become a part of the general digital clatter that slows down its performance and turns the mighty machine into the burial chamber for useless bits and bytes. Unfortunately, Aperture 3 lacks the duplicate scanning function, which complicates the process of photo library decluttering. Keep on reading to find out how to detect and remove identical images from Aperture. If you are not sure whether it is necessary to cull out the desirable photos from your library and remove the rest, lets’ gauge the size of your image collection. By doing so, you will understand the scope of the problem. The simplest way to measure the size of your photo library is through the use of the Finder. Just launch the utility, locate the Pictures folder and right-click on it to access the Get Info option. 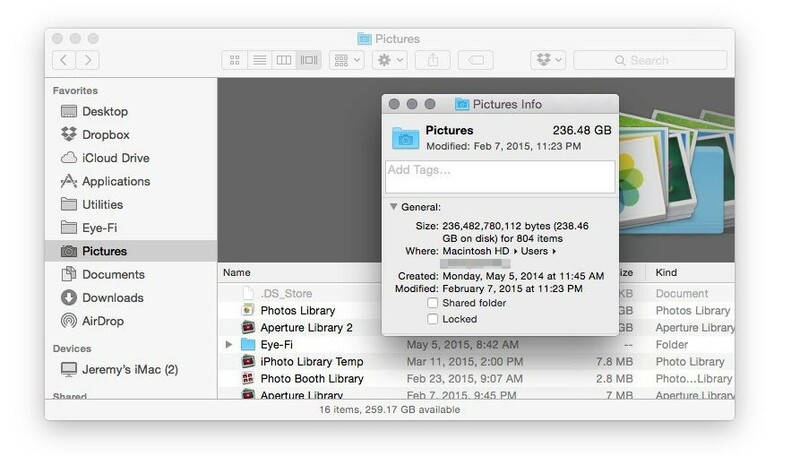 Check the pop-up window to find out how many gigabytes of pictures are on your Mac. If you are anything like an average Mac user, it is extremely likely that the folder’s size exceeds your wildest expectations. After checking how much my Picture folder weights, I’ve realized that there are tons of duplicate photos that I should eliminate from my drive. And so should you. The information explosion of the recent years has put stringent limits on what is to be stored on a computer and what is to be removed. Obviously, duplicate files shouldn’t enjoy the benefit of being the part of your system. They contribute nothing to the enrichment of the user experience: quite the contrary—they slow down your Mac. If you haven’t been prohibited to use the copy/paste function, you will quickly churn out an armload (a driveload) of photos if there’s such a need in the future. So, let’s get down to the meat of the matter. To dispose of identical images in Aperture, you will need a professional duplicate-finding utility. The need for the utility is dictated by the disheartening size of the library. Another reason for having recourse to a duplicate finder is grounded in the inexpediency of the manual approach to the task. It would take a week to find and remove all the duplicates by hand. Furthermore, even if you have the doggedness to complete the task (kudos to you for making a Guinness world record), there’s no guarantee that you haven’t left behind thousands of slightly dissimilar images. Such files have different names; therefore, it is harder to find and weed them out. So, instead of grinding your fingers to a pulp while trying to hunt down identical photos, it is more reasonable to avail yourself of cleaning utilities. What to look for when choosing a duplicate finder? Nowadays, almost all duplicate finders are quite adept at performing their primary function – finding and removing indistinguishable photos. It’s additional features you need to pay attention to when downloading a cleaning utility from Apple App Store or the Web. The best duplicate finders keep the log of removed images, which helps to restore them later. Moreover, great apps allow their users to set various search parameters such as file types, sizes, and names, thereby fine-tuning scanning results. Quality duplicate finders also have a picture preview function, which makes it easier to understand what to keep in your Aperture library and what to delete. What MacOS version do you use? How do you deal with duplicates? Tune Up vs. Dupin Lite 2 Review: Which Is Worth Picking Up? Duplicate Annihilator vs. PowerPhotos Review: Who Wins?